Film based in the comic written by Jan, 'Superlopez', that tells the stoy about a superhero called like that, who came from another planet called Chitón. The story will tell the origins of the Spanish hero, when he land in Catalonia. Starring Dani Rovira and directed by Javier Ruiz Caldera, the movie is expected to be released by the end of 2018. Born as parody of DC's Superman Cómics, Jan's stories concerning Jo-Con-Él, a baby that after slipping past in a rocket goes to the Earth adopted by the Lopez marriage. He grows as one more but trying to control his powers, besides fight against the evil. As adult, it is employed at an office of Barcelona while he acts as superhero furtively under Superlópez's name. Write your own 'Superlópez' review. Dani Rovira and Alexandra Jiménez reunite in 'Superlópez'. Previously, they've worked together playing a couple in the film directed by Marcel Barrena, '100 metros'. At the beginning, Álex de la Iglesia ('The Day of the Beast') was going to direct 'Superlópez' and José Mota ('Abracadabra') was expected to play the hero of the movie. 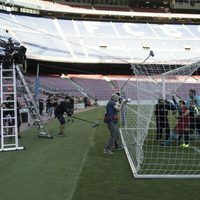 'Superlópez' won't be on theatres until November, but the new film leading by Dani Rovira will debut on October 11 in Sitges.